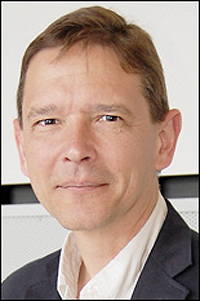 Adomaitis is the director of the Thin Film Processing Group, which focuses on simulation-based design, optimization, and experimental evaluation of advanced materials manufacturing processes. The group is particularly interested in developing new reactor designs for thin-film deposition of semiconductor materials for electronic and solar energy applications. ChBE/ISR Professor Ray Adomaitis (center, holding trophy) receiving the ITT Department of Chemical and Biological Engineering's Charles W. Pierce Distinguished Alumni Award. Adomaitis is an elected Fellow of the AIChE and previously served as ChBE’s Acting Chair. He received his B.S. in chemical engineering from IIT in 1984, and earned his Ph.D. there in 1988.